In the spring of 1998, I met a beautiful girl while working at a kiosk in the mall. We quickly fell in love and moved in together a few months after we started dating. I did not want to have any secrets between us, so I came out to her as a transgender woman. As time went on I mainly presented as her boyfriend when we were out in public, but as soon we would get home we would put on our matching nightgowns. Ten years later we decided it was time to start the next chapter of our lives. In March 2008, we managed to pull off a traditional wedding ceremony during the worst blizzard our hometown had ever seen. During the ceremony, she wore the dress I had always dreamed of — and I wore a suit. When the wedding was over and we were in the safety of our honeymoon suite, she asked if I would like to try on her wedding gown. We’d been in the closet together for nearly a decade, and it was a struggle. But that night we vowed that one day we would live out loud. After the birth of our third child, my wife and I started going out on more date nights where I would present as my true female self. At the end of one of our nights out, I began to cry as I took my makeup off. My wife saw the quiver in my lips and knew it was because I had been progressively struggling with my gender dysphoria. She laid her hand on my shoulder and said, “Please don’t let me be the reason that you are holding back from presenting as your true self.” At that point, my tears of sorrow quickly turned into tears of joy because it was clear we were both ready for me to finally blossom into the person I was destined to become. As my transition moved forward, our traditional wedding rings quickly became obsolete since mine no longer matched my gender identity. But without a ring on, I appeared single and my spouse appeared to be married to someone other than myself. So we considered trading in my masculine band to help with the cost of a new women’s diamond bridal set. When we were leaving for the jeweler, my wife picked up my old ring and slid it onto her thumb. The drive gave her time to reflect on the life, love, and history my ring had represented to her and to our marriage. At the counter, in a split-second decision she looked at my ring sparkling in the light and decided there was no amount of money that could take its place. Instead, we went home and did a bit of research on the significance of thumb rings. Some stories told of Civil War soldiers who would give their wedding bands to their wives to wear on a thumb for safekeeping just in case they never returned from battle. Others stated that many lesbians and bisexual women often wear thumb rings as a symbol of their pride. These definitions were extremely profound to us. 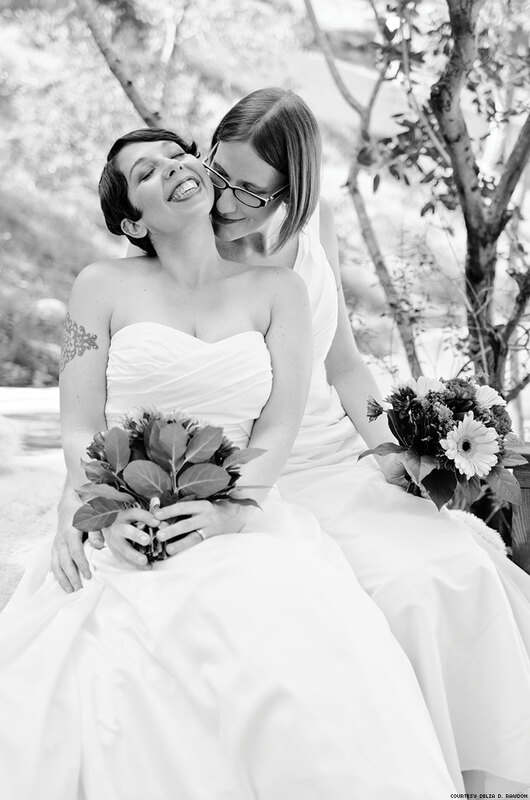 We held our 10-year vow renewal ceremony in Los Angeles’s Topanga Canyon. I once again stood at the altar in front of my best friend, life partner, and strongest ally. We recited our wedding vows while wearing perfectly coordinated wedding dresses with our three beautiful children by our side. My heart pounded as we exchanged rings. She said that having my original band on her thumb and her original wedding set left in place gave her a feeling of profound balance and wholeness. For other couples navigating the murky waters of gender transition, I encourage you to be open and honest, set realistic goals, and not let the light of the future cast a shadow on your past. Continue to hold on to those symbols that express your love and gratitude for each other. We did. DELIA RAWDON is an actress who has appeared in Transparent and Where the Bears Are.